Earlier this month, Lancashire based company Three Bears Yarn launched a new collection of cotton yarns to the public. When the company invited me to take a look at their yarn I agreed of course – great cotton yarns are always appealing to crocheters – and these didn’t disappoint. I was sent two yarns to test, the DK “Affection” which comes in a range of 12 twelve colours (mostly pastel) and I really enjoyed using it. I was also sent a selection of Chenille, also listed as a double knit. I have to admit, this was my favourite! Chenille yarn fell out of favour with designers, I’m not sure why and it definitely deserves a place in the crocheter’s toolkit. Partly to test the yarn, and partly because I had a hankering for a new scarf I set to work creating a ruffle scarf – a bit like chenille, the once common crochet ruffle scarf is set for a new lease of life and this simple pattern is a great introduction to both. I’ve posted the pattern below (you’ll need about 450m to make the scarf as written). Three Bears cotton yarns are available in 4 ply, dk, aran and chenille via their website and are already proving popular with toy makers and bloggers. They currently offer a “hibernation pack” at a special price of £29.99 which is great value, You can find Three Bears Yarn on facebook and instagram, where they often share sneaky peeks of new designs and behind the scenes at the mill. In addition, they have been a thoroughly nice company to work with and I’m delighted that at least one of my designs in their cotton yarn will appear in print soon. Do check them out by visiting their website. 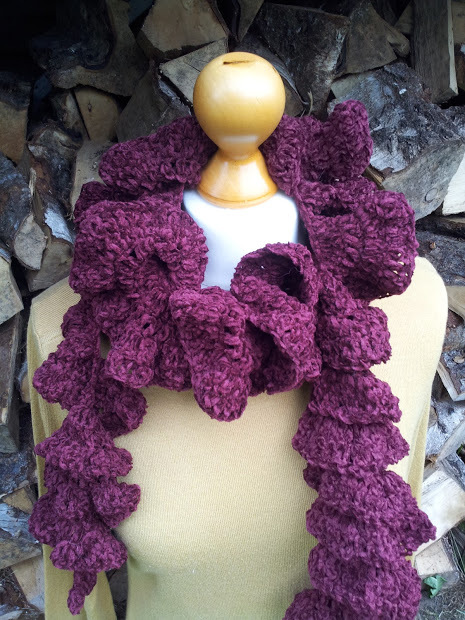 The pattern for my ruffle scarf will be available soon.